For the first time under Mayor de Blasio, NYC DOT plans to increase parking meter rates citywide. Starting next month, DOT will update on-street parking meter rates throughout the city for the first time in seven years. While it’s not the parking plan of Donald Shoup’s dreams, it’s an improvement over the status quo. The very low price of metered parking will be going up citywide, with bigger rate increases for busy commercial districts. Cheap metered parking on commercial streets is a problem because it prevents spaces from turning over, causing drivers to cruise for spots or double-park. Currently, metered parking in most areas outside of Manhattan below 96th Street goes for just $1 per hour. This makes neighborhood retail districts hotbeds of traffic dysfunction, slowing down buses and making biking and walking more stressful. The new system consists of six tiers of hourly parking prices, ranging from $1.25 in some neighborhood shopping districts to $7.50 for drivers who park longer than an hour in Manhattan’s most crowded commercial areas. A map of the new parking prices is on the DOT website, though it doesn’t differentiate between metered spaces and street parking that remains completely free (which is the vast majority of it). The last time citywide parking rates increased was 2011, when the typical price outside of Manhattan rose from 75 cents per hour to $1. In Brooklyn, standard hourly meter rates will increase to $1.25. In Manhattan between the north side of 96th Street and the south side of 110th Street, it’ll cost $2.50 an hour to park. Below 96th Street, where most meters currently charge $3.50 an hour, DOT will increase the time limit on parking from one to two hours while raising rates. The first hour will cost $4, the second hour $6.75. High-demand areas in Midtown and Lower Manhattan will see slightly higher rates — $4.50 for the first hour, $7.50 for the second. The city will also designate “outerborough business districts” — in Downtown Brooklyn, Flushing, Jamaica, and 125th Street in Manhattan — where parking is $2 per hour, as well as $1.50-an-hour “neighborhood retail districts” throughout the city. PARK Smart, the DOT program that attempted to adjust meter prices based on demand, will be discontinued in Greenwich Village, Park Slope, and downtown Brooklyn, which will be absorbed into the new zones. A version of the program that increases rates after the first hour will continue in Jackson Heights. The new prices will go into effect in Brooklyn on September 4, followed by Manhattan on October 1, Queens on November 1, and the Bronx and Staten Island on December 3. It’s unclear whether DOT will also be metering curb space that is currently free. DOT said more information will be available later this week. These meter rate increases may or may not be large enough to make a noticeable dent in traffic, but they signify a more sophisticated approach to parking prices. It’s the first time DOT has set parking prices citywide in a way that responds to different conditions in commercial areas, according to parking policy expert Rachel Weinberger. “There are important distinctions [between] the neighborhoods, and I think DOT is trying to find a way to acknowledge that,” Weinberger said. In the blue zones, meter rates will rise to $1.50 an hour. In the green zones, $1.25 per hour. Golden may not care about all the ways cheap parking harms his constituents, but it’s a good sign that DOT is finally taking action on parking meter prices under Mayor de Blasio. It’s a good first step but as the article alludes to, a large part of the problem is areas where parking is free. There should be no free parking at all in all of Manhattan and the more congested parts of the outer boroughs. Free parking just encourages car ownership even when those cars are seldom used. For example, a lot of Manhattan parking is taken up by people who only drive their car from one parking space to another on alternate side days. The rest of the time the car is unused. It’s not serving any practical purpose for the owner other than a security blanket. It’s also using valuable street space better put to other uses. Everyone would be better off if such people could be encouraged to just give up their cars. The backlash would be strong. A resident parking permit for Manhattan streets would be something they should explore. Give exemptions for the working poor who also own a vehicle. They need to explore this ASAP. The permit program is more politically feasible and could increase in cost over time. It would also push out a lot of vehicles with out of state registration. I disagree with exemptions for the working poor. Dump the car and save some money. If you are driving to a low wage job in a metered area, you’re doing it wrong. Exactly right about the working poor. One reason people are poor in this country is the need to own a vehicle in most places. In places where you don’t need to own a car, like NYC, we shouldn’t be offering any incentives to do so. I also think in the long run encouraging the poor and people who don’t use their cars to get rid of them will be similar to weaning people off smoking. They may resent the interference in their lives at first, but once they’re car-free (or cigarette-free) they’ll realize they’re better off and thank you for it. I live on Amsterdam Avenue on the UWS. One side of my block has meters. The other side doesn’t. Several years ago, I wrote DOT asking for meters to be installed on the side without any. They said no, for no good reason. Makes no sense. Too expensive! This will discourage people from driving in from VT and shopping at my store! At this rate, the city will have a sensible parking policy in line with market rates in [taps calculator] 500 years. The CBD rates aren’t bad – and southern (below 96th) Manhattan rates aren’t either. But everywhere else? Next to no change. There are old photos of the neighborhood all over the halls of my building. in the 1950s marking meters on Flatbush Ave were in effect 7am-10pm where they currently are only in effect 7am-7pm. I would bet that the hourly rate was probably more than the new $1.50/hour rate, too. Maybe they actually enforced double parking rules back then, too. 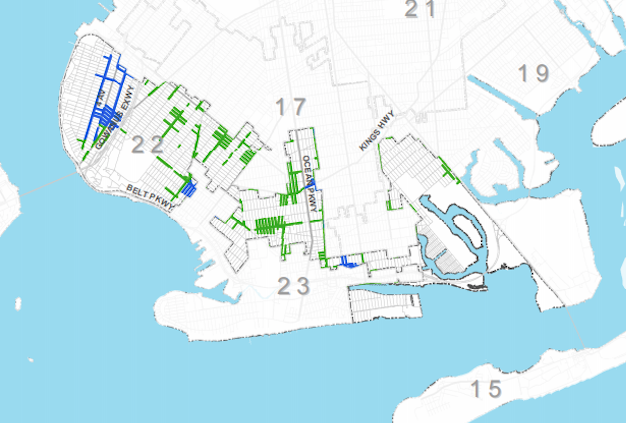 I assume the map is wrong, as it shows one entire side of my block becoming metered, when currently only the 5 spots closest to a major commercial street (on both sides) are. Though honestly, that metered portion should be significantly longer. Same thing with my block. I’m pretty sure that it includes all of any block that has any metered parking so it understated the amount of free parking significantly in areas. Here’s one thing I’d love to see regarding parking: how about doing what the MTA has been doing every year – building in automatic increases every few years. Or tolls rising on the crossings. That way the public knows it is coming and that there is an economic price to using our streets. But still WAY TOO MUCH FREE PARKING available. Pushing out people that register out of state would be a good thing – they’re committing fraud by claiming they love elsewhere. Probably cheat the state and city out of taxes too by claiming an out of state residency. How does the increase in the price of public car storage compare with the hikes in subway fares? I guarantee you that transit riders have faced a far steeper increase over the years. Rates should be raised annually. It’s free money and until we rid this place of cars, a good source of revenue. Recall that until the 1950s, it was illegal to park overnight in Manhattan. The idea that one could store private property curbside is a abberration. Those of us chiming positive reviews about this increase obviously don’t drive or transport goods as an occupation. For them that do, they.recall the days when commercial parking was given a preference, parking was free and traffic flow had consistent patterns.. Seven year have past since Mayor Bloomberg made that change and hundreds of millions dollars have been collected. Yet our streets and parkways remain in disarray, our traffic flow is stagnant and our transported goods are frequently Tardy. So how can he NYC DOT justify this increase? When will We,l the Public, benefit from the capital raised from parking fees? You can thank Uber. Next time you walk down any street, take notice of how many parked cars have T&LC plates. It’s disgusting.